This handsome little bunny man was named Maxwell. He died in the middle of the night a few days ago after waging a brave battle he almost won. Maxwell came into our foster several months ago from Oakland Animal Services. 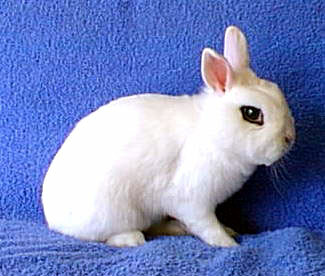 He was a feisty little dwarf hotot with a breeder tatoo in his ear and dramatic black markings around his dancing eyes. He was left at the shelter with a severe malloclusion by people who no longer wanted him. He was active, willful, playful and happy, though we soon discovered that he was in pain from an abscess in the jaw behind his eye. All his teeth were infected and pointed and he needed acute major dental surgery and ongoing intensive dental work. After emergency surgery to clear the abscess in his jaw, he lost some use of his facial nerves. For a while he couldn't blink or close one eye and he needed eyedrops constantly to keep his eye moist. He needed to be hand-fed and closely monitored. The veterinarian who did the surgery, Dr. Debra Scheenstra, fell in love with Maxwell and adopted him as a member of her family of special needs animals. Maxwell slowly recovered the use of most of his facial muscles and began to relish eating and spending time getting love and attention. Soon Maxwell was feeling well enough to meet Wendell, Dr. Scheestra's other rabbit that had been adopted from our foster center two years prior. Wendell's mate had died and he was lonely. Feisty little Maxwell let big Wendell know who was the boss right from the start! But it ddidn't take long for the two boys to become good friends and snuggle bunnies. They shared a room together and the love and care of Dr. Scheenstra. Maxwell had come so far---from a rabbit with a very grim dental prognosis to a buddy rabbit sharing toys and playtime. Dr. Scheenstra sometimes took Maxwell along with her on education outings to schools and groups to discuss how poor breeding and over breeding can lead to health problems, such as the malloclusion and molar problems from which Maxwell suffered. Though he still needed medication and special care, Maxwell was starting to thrive. Sadly, this special little guy suffered a bout of GI stasis that proved fatal. Dr. Scheenstra tearfully told us that she had been up all night with Maxwell, but had not been able to save him. We loved Maxwell and will miss him. Much gratutude goes to Dr. Debra Scheestra for her compassion and care for Maxwell. For those of you who had oringinally made donations towards Maxwell's surgery when he first arrived, we thank you. If you would like to make a donation in his name or in honor of your rabbit to help other rabbits in need, please consider making a donation to the Ruby and Grover Memorial Fund on this site. Goodbye Maxwell. We love you and we'll miss you!